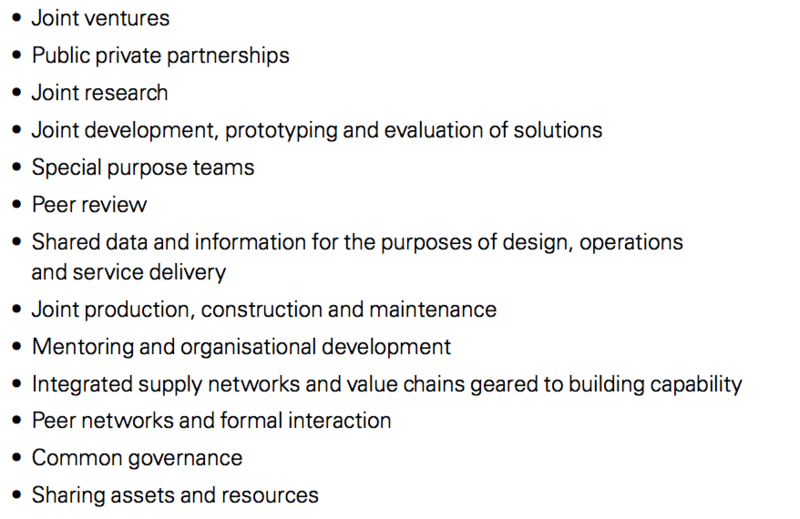 The word ‘collaboration’, much like ‘innovation’, has been bandied about with some regularity in defence industry circles of late but what does it really entail? KPMG, tasked with assisting Government and Defence in the daunting task of building defence industry capability, has released a report outlining what successful collaboration looks like and its vital importance for achieving the overarching aim. 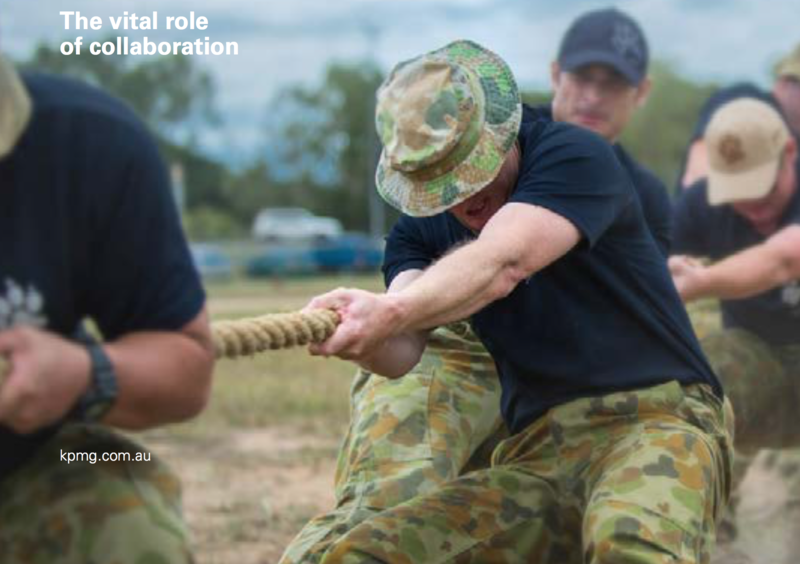 The KPMG report “Building defence Capability: The vital role of collaboration “ (dowload here), was presented at the NSW Collaboration for Defence Symposium held at the University of Technology Sydney mid Feb 2017. In a defence collaboration survey conducted by KPMG in 2016 with defence and industry staff, 87 per cent of those surveyed were either implementing a model of collaboration or planning to in the next 12-24 months. However significant challenges remain with 74 per cent ranking culture and leadership of their organisation and that of their main partner as the significant barriers to more collaborative relationships. Attitudes and behaviours, according to the report, will count more than contracts and policy when it comes to establishing effective collaboration. The Integrated Investment Program is intended to facilitate the whole-of-life and whole-of-capability approach to investment. Defence’s new Capability Life Cycle (CLC) requires industry involvement earlier in the process, with engagement expected to commence routinely before Gate Zero for most projects. According to the report, this new approach will require capability developers to be flexible and fast, as well as a change in behaviour from all involved. “Quite simply, early engagement with industry is going to be the key to taking advantage of what industry has to offer so that we are all working together to ensure our war fighter has the best, ”former CEO Lockheed Martin ANZ Raydon Gates said. While frameworks, standards, and models were important, KPMG stated it was the culture of the organisation that “makes or breaks collaboration”. The report details characteristics of effective collaboration and provides numerous case studies highlighting experiences of the UK MoD and the healthcare sector. How can we build a stronger defence capability? The First Principles Review: Creating One Defence was quite clear about the nature of the problem. Defence’s organisational model and processes were complicated, slow and inef cient. 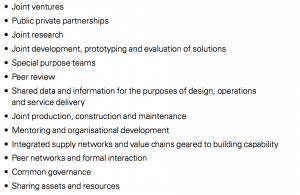 Its approach to engaging industry, especially early in the project life cycle, was unsophisticated and staff were obsessively focussed on probity and competition requirements. a shift to viewing the outputs of Defence industry as a Fundamental Inputs to Capability integrated into the acquisition life cycle. a recognition that industry is part of Defence’s enabling workforce with an estimated 25,000 (in Australia ndr) people employed by industry delivering inputs to capability, including major military equipment, and several thousand staff employed by contractors to maintain and secure Defence bases. The importance of collaboration cannot be understated during this time of change. In fact, we believe that it is the foundation for success. We need to stress that frameworks, standards and models are important but our experience shows that it is the culture of the organisation makes or breaks collaboration. People at all levels need both ‘hard’ and ‘soft’ skills as relationships evolve over time during the capability and acquisition life cycle and in response to new information. Leadership will be essential. All staff will need to look for ways to model openness and trust and demonstrate a willingness to embrace difference and diversity. Timely and honest communication, a learning mind-set, agile and adaptive behaviours will be essential. The challenges are great, both organisationally, culturally and in the wider policy and strategic context. Only collaboration can give Defence and its partners the resilience and agility to anticipate and respond effectively in this environment.